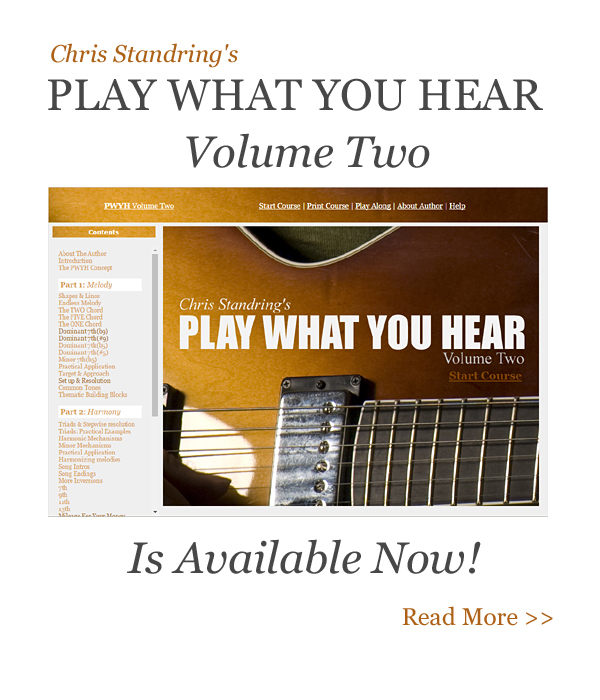 Chris Standring presents the second of his jazz guitar masterclass series. Focusing entirely on improvising in chord melody style, Chris discusses the art of playing melodies with chordal accompaniment in the style of the great master jazz guitarists like Joe Pass, Ted Greene and George Van Eps. In this 11 lesson program Chris discusses building harmonic vocabulary, ammassing ideas over the 2, 5 and 1 chord families as well as performing 3 solos on camera, utilizing all the information he discusses throughout the program, all transcribed with notation and TAB. Comes with play along tracks, spiral bound workbook and optional DVD. Hi Chris - I thought that JGVM vol 2 really hit the mark. It's the kind of instruction that makes playing guitar fun. I've always leaned toward playing the standards; in particular ballads. The tunes you provided and the treatment afforded each was just right for someone like myself. Nice job! - Bob DeVivo.